The first violin part for Rimsky-Korsakov's Capriccio Espagnol, Op. 34 has been edited by Andrés Cárdenes, former concertmaster of the Pittsburgh Symphony Orchestra from 1989 to 2010. Cárdenes' bowings, fingerings and other editorial markings have been added throughout the score. Written in 1887 by Nikolai Rimsky-Korsakov, Capriccio Espagnol is a five-movement orchestral suite based on Spanish folk melodies. Rimsky-Korsakov originally intended to write the work for a solo violin with orchestra, but later decided that a purely orchestral work would do better justice to the lively melodies. The piece is often lauded for its orchestration, which features a large percussion section and many special techniques and articulations, such as in the fourth movement when the violinists, violists, and cellists are asked to imitate guitars. 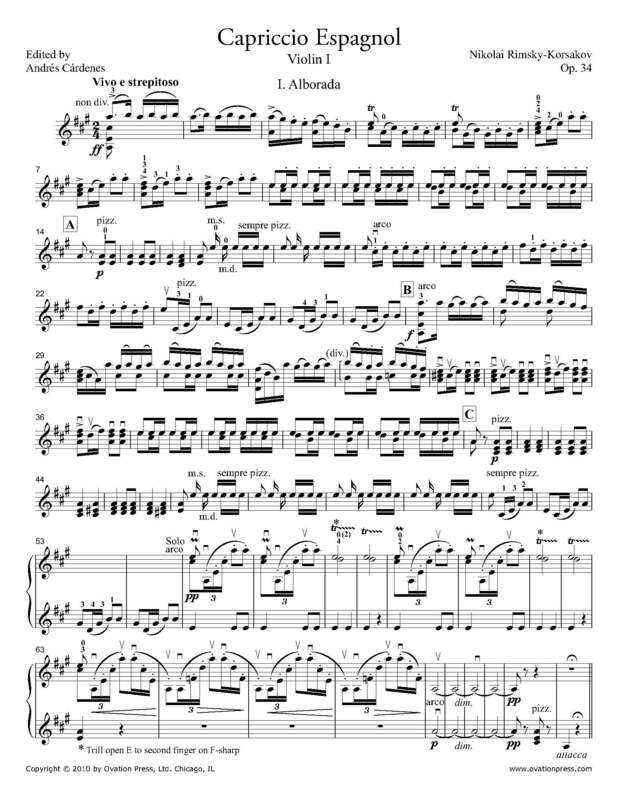 Download and print the score today to gain access to expertly edited Rimsky-Korsakov Capriccio Espagnol violin fingerings and bowings from Andrés Cárdenes!